After taking several weeks off for the holidays, it's time to get back to writing. What better to talk about than food. We've all just spent several weeks eating out with friends, attending parties and there was, of course, the big Christmas day dinner for those who celebrate it. For me, this was my last week before things get crazy again and I used it to nest, peruse recipes and enjoy cooking. I loved every minute of it. In winter I want comfort food. Soups and stews homemade in the crockpot, warm one-pot meals from the stovetop or oven and quick breads that can be just stirred together in a few minutes and popped in the oven top my list. A key ingredient in many is carbs. Yes, I said the dirty "C" word of the current diet industry and I honestly don't care. In the summer I can happily munch away on fresh salads and fruit, but in the winter I need my comfort food to fuel the fire and potatoes, pasta and bread fresh from the oven fill a need like no other. Today I'm going to share two dishes I made this week - one potato, one pasta. In a future blog I will have a column on my favourite quick breads including a recipe I found after having lost it many years ago. 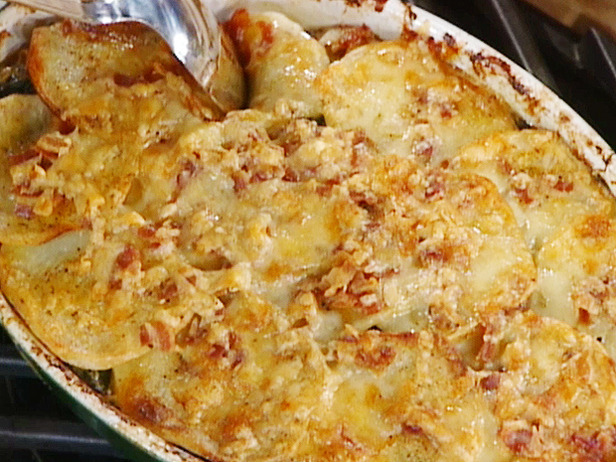 The most famous potato dish for comfort food is Scallop Potatos, with or without ham. Traditionally this is very simple to make. I have one self-published book that has the most classic version I have seen. Simply layer sliced onions and potatos in a casserole (2-3 layers is the norm) until you have it until it is fairly full. Sprinkle each layer with salt, pepper and flour. Gently pour warm milk overl and bake covered until done in a 350 F oven. If you do it just right, the milk turns into a creamy white sauce. If you do it wrong, there are lumps through out. It still tastes good, but looks funny. Trying to guess how much of everything is hard and I have only got it right once. I am alway interested in new versions of this classic and this one caught my eye. It's has a twist in that they use broth instead of milk. I am giving the original recipe first and then how I changed it to add the ham. Pre-heat oven to 375 F (190 C) Thinly slice potatos and onions (a food processor is a god send to accomplish this). The original recipe says to peel the potatos, but alway leave the skin on and just scrub them. In a greased 9 x 12 pan (Note - I found this a bit small and would go one size up), spread half the onions and top with half the potatos. Sprinkle with half of the thyme, salt and pepper. Repeat layers. Sauce - In saucepan, melt butter over medium heat and blend in flour. Slowly whisk in the stock and cook stirring until thickened. Mix in vinegar. Pour over potatos. Cover and bake for 1 hour and 15 minutes or until tender. Topping - melt butter in sauce pan, stir in crumbs and parsley. Sprinkle over casserole and broil for 2-3 minutes until golden. Sauce - Increase to 1/3 butter, 1/3 flour and 3 cups of broth. Add 3 cups of diced ham to the layers: onion-ham-potato-onion-ham-potato. You definitely will need a larger pan if you do this variation. This recipe is from Weeknight Dinner by Fine Cooking. It has a nice little kick of spice without being overly hot. Originally they asked for 1/2 lb. chicken, but that seemed not enough for 1 lb. of Penne, so I doubled it and it seemed just right. This says it serves 4 to 6, but it would have to be 4 really hardy eaters. 6 is about right, depending what you serve with it. I just added a great green salad and we were stuffed. Also, I love cheese so doubled it, a personal choice. 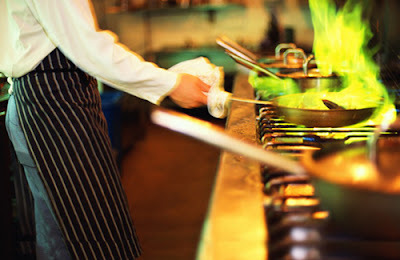 Remember, that's what cooking should be about. Don't be afraid to adjust things to suit your personal taste. We're all different. Bring a large pot of well-salted water to a boil over high heat. Meanwhile, heat the oil and garlic in a 12-inch skillet over medium heat, stirring gently so the cloves don’t break up, until they become light brown in places and very fragrant, 2 to 3 minutes. Add the rosemary and red pepper flakes and cook until they start to sizzle, about 15 seconds. Add the chicken, sprinkle with 1/4 tsp. salt, and cook, stirring often, until the chicken loses its raw color, about 2 minutes. Remove from the heat and stir in the olives. Add the penne to the boiling water and cook, stirring occasionally, until just barely al dente, 1 to 2 minutes less than the package instructions. 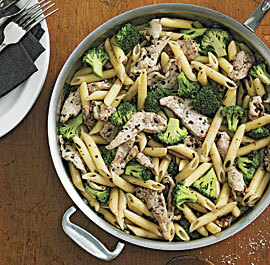 Add the broccoli and cook until it turns bright green and the pasta is tender, about 1 minute. Reserve 1/2 cup of the pasta water, and then drain the pasta and broccoli. Discard the garlic from the olive mixture. Add the pasta and the pasta water to the skillet and cook uncovered over medium-high heat, stirring, until the pasta absorbs most of the liquid, about 2 minutes. Stir in the lemon juice and half of the Pecorino. Serve sprinkled with the remaining Pecorino. Note - I put this dish into a 9 x 13 casserole dish, THEN sprinkled the remaining cheese on and tossed it in a warm oven for just a couple minutes to heat the pan and start the cheese melting. It kept the food warm at the table for those who wanted seconds. So go ahead, risk it, and let a few carbs back into your diet. It's all about balance and if you're eating right over the course of the week, a great carb dish on a cold winter night will warm you up and nourish you, body and soul.